We called them the Communists, after the ruling party, but the country was The Union of Soviet Socialist Republics. (Союз Советских Социалистических Республик or Soyuz Sovetskikh Sotsialisticheskikh Respublik) Battle of Quotes. 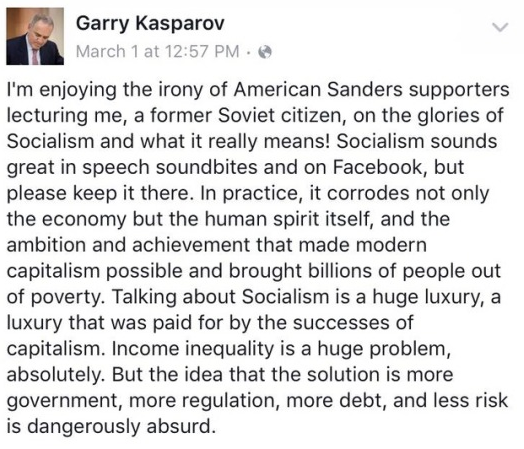 Commenting (third hand) on a Twitter “conversation” about Socialism, SiGraybeard had a few comments, but his link to Kasparov deserves to be repeated. There are still plenty of people who escaped from the old Soviet Union and Warsaw Block living in this country. It is sad that they are not sought out by the media more. They lived through Socialism. But then the media won’t even report on what is going on today in Venezuela. The government’s plan to fight hyperinflation is going about like you’d expect. The New Venezuelan Currency Is Just Three Weeks Old and Inflation’s Already 100%. After a week and a half of no changes in the Bloomberg Cafe Con Leche Index, the price of a cup of coffee has surged the past two weeks, climbing to 50 bolivars from 25 bolivars. For those still struggling to get used to the new pricing system, 50 of today’s bolivars equals 5 million of the old ones. Annual inflation is ABOVE 100,000 percent. In the 1990s, Venezuela was Latin America’s fourth largest economy, behind Brazil, Mexico, and Argentina. However, after several years of a Chavista administration, the country’s debt has increased significantly. Though the government will not provide official statistics, Venezuelan economists Asdrúbal Oliveros and Gabriel Villamizar place the country’s debt at $249 billion as of August 2015, nearly 190 percent of its 131.6 billion GDP. The nation’s public debt stood at $40 billion when Hugo Chávez took power in 1999. I wonder why all the Lefties who were flocking down there a few years ago are now staying away. Venezuela has reached that point, described by Margaret Thatcher, where they have run out of other people’s money.